← Christmas in Barcelona – Food, Festivities and Fun! Barcelona is a place of many architectural wonders, many of which were designed by the famous Catalan-born Antoni Gaudí. 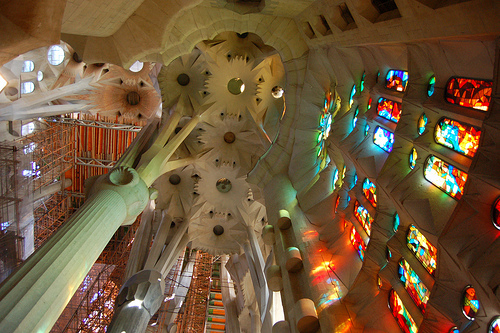 But if you are coming to this beautiful city, whether on holiday, a short weekend break or a business trip, you must make sure that you do not leave without visiting arguably the most impressive structure in the entire region of Catalonia: La Basílica i Temple Expiatori de la Sagrada Família. The history of the church dates back to the 1877 when a devout organization bought a plot in the new Eixample district to mark the end of de-Christianization, starting with industrialization and increasing wealth of the city. Actual construction of the church began in 1882, led by architect Francisco de Paula del Villar until 1883. 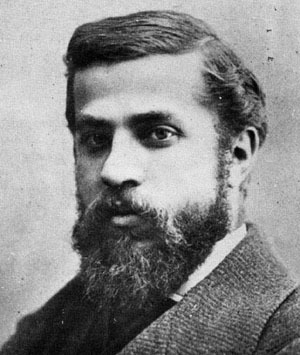 Then, at age 31, Antoni Gaudí took on the project, and would devote the rest of his life to the construction of the magnificent church, until his death over 40 years later. 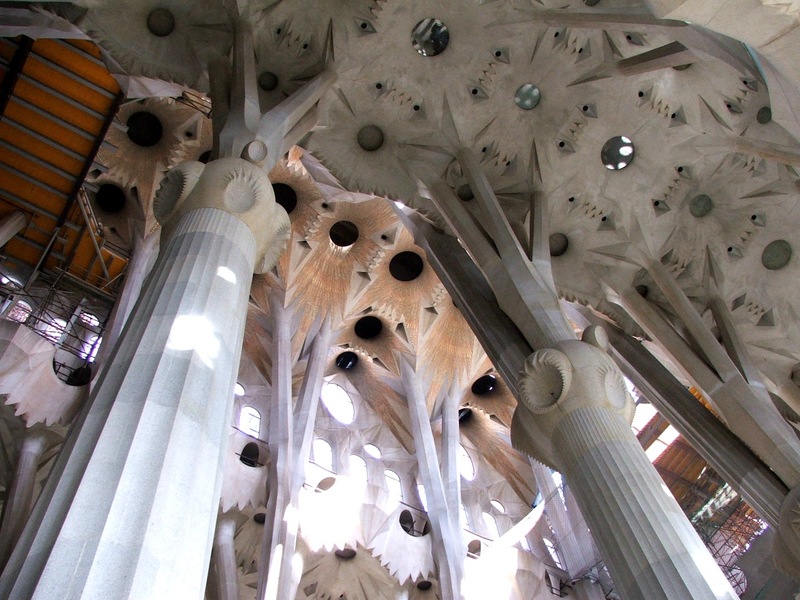 Gaudí took it upon himself to completely change the original design of the Sagrada Familia converting it to a modernist style based on forms of nature. The construction was interrupted in 1935 because of the lack of funds and the outbreak of the Spanish Civil War. During the war, Catalan anarchists destroyed many of the models and designs Gaudí left behind after his death, but luckily the church still stood after the war whereas many were burnt down. Construction started back up in the 1950s and the building is still being worked on today. 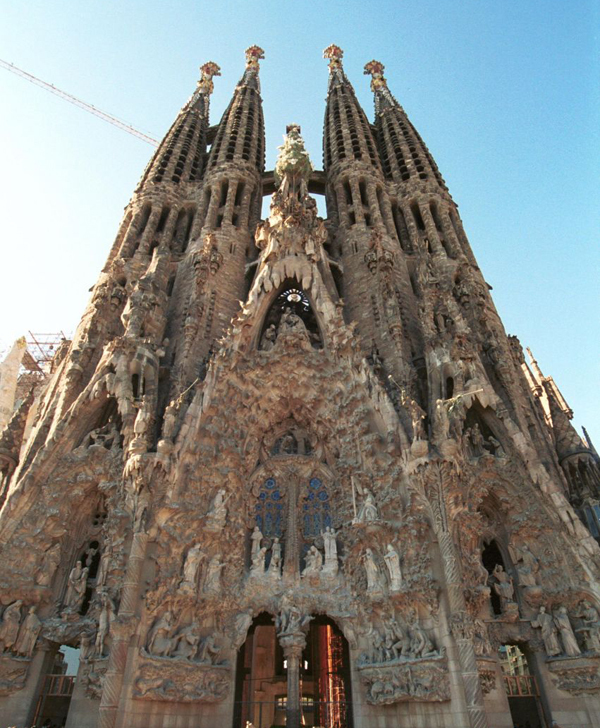 The Sagrada Familia is an expiatory church, meaning it has been funded entirely by donations from the outset. The basilica has a cross shaped layout, 95m long and 60m wide, and a capacity for 13,000 people. At present, there are 8 towers, but by the end of construction, the building will have a total of 18 towers, 12 of which will represent the 12 apostles, 4 will represent the four evangelists and will be slightly taller, 1 will represent the Virgin Mary, and finally, a centre tower, which will rise 180 metres, representing Jesus. When walking around the building, you can also see the pinnacles at the top of the towers decorated with colourful mosaics with various textures as well as three façades: one dedicated to the passion and death of Christ, another celebrating the birth of Jesus, and the Glory Façade. Technological advances have helped speed up the construction of the Sagrada Familia, but the process still remains considerably complicated. The church is estimated to be completed in 2026, however this is still pending, as an actual planned date remains unknown. 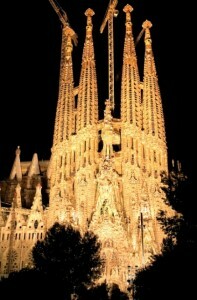 The Sagrada Familia is located on Caller de Mallorca, 401 and is open from 9am to 6am. To get there, you can take the metro L2 (purple line) or the L5 (blue line) to the Sagrada Família stop. Tickets for entry to the church cost around 12,30 Euros and can be purchased upon arrival (although it is recommended that you buy your tickets in advance online from http://www.ontiendas.com/ofertas/servicaixa.html to avoid queuing). You also have the option of taking an audio guided tour, available in 8 different languages, and also to visit the top of the towers to see the spectacular views of Barcelona. Inside the Sagrada Familia, you can see Gaudí´s tomb as well as the museum and various exhibitions, including models of his original designs. The Sagrada Familia truly is a must-see on your trip to Barcelona, whether you decide to spend a whole day in admiration of this incredible masterpiece or only an hour or two. For more info, check out our Sagrada Familia Barcelona video on YouTube channel! There is also the option of renting one of the Sagrada Familia apartments in Barcelona, allowing you to look out onto the amazing building or pass by it every day. This entry was posted in Home, Places, Travel & Vacations and tagged Barcelona accommodation, barcelona apartments, Barcelona culture, barcelona history, barcelona tourist guide, Gaudi, gaudi architecture, museums in Barcelona, sagrada familia. Bookmark the permalink.